What's a Creative Commons License? 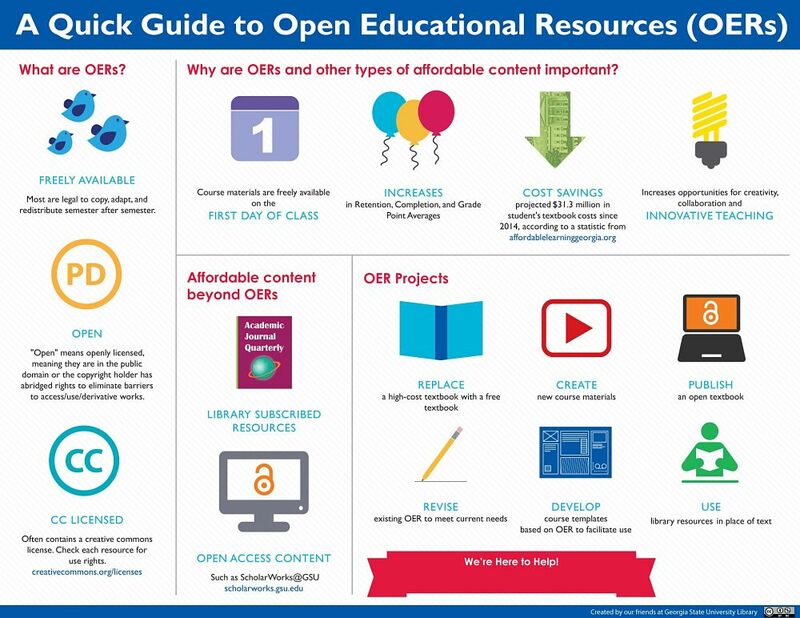 How can librarians help with OERs? Library resources are usually not free of copyright restrictions so they cannot be adapted, copied, or distributed without the permission of the copyright holder, even for educational purposes, so technically speaking, they aren't OERs. However, since library resources are free to use and many electronic resources have unlimited users, they can fill the same needs as OERs in many situations. How to get links to library resources to put in your iCollege class. Most work for websites, too. Textbook costs are rising much faster than the rate of inflation....and students are responding. Bureau of Labor Statistics: College Textbook costs rose 88% between 2006 and 2016. Bureau of Labor Statistics, U.S. Department of Labor, The Economics Daily, College tuition and fees increase 63 percent since January 2006. The Consumer Price Index rose by 21% during the same period. "Government Accountability Office: College Textbooks" reports the cost of student textbooks rose 82% between 2002 and 2012. Affordable - Increasing cost of textbooks has led some students to forego buying the text at the expense of learning, often accepting a lower grade as a consequence. Therefore, OERs can promote student learning and retention. Accessible - Electronic texts are available immediately -- No more waiting for the mail or out-of-stock books at the bookstore. Copyright - Instructors are often uncertain what the restrictions are on various types of materials. While librarians aren't lawyers (at least, most of us aren't! ), faculty benefit from basic explanations of Creative Commons licenses, Fair Use, and Copyright. Bookstores - Questions often arise about the impact of OERs on the college bookstore and the revenue they generate for the college. The role of bookstores is changing, not only because of OERs, but because of competition from online booksellers and other factors. Here's an example: University Bookstores Change with the Times. Some bookstores are finding ways to participate in OERs. Search for and contribute OER content. Create an account to save items to "favorites" folders. MERLOT is a curated collection of free and open online teaching, learning, and faculty development services contributed and used by an international education community. Use the Advanced Search to limit by subject, educational level, type of resource, and more. The Content-Builder facilitates creation of new OERs. OpenStax College has open, peer-reviewed, free e-texts with support materials for instructors. Offers an option to purchase print copies at cost. Many academic libraries have created Research Guides (sometimes called LibGuides) with OERs selected for their specific population. See the Learn More page for examples and be sure to check with your librarian! Quality of content - Of course! We did not require peer-reviewed content, but carefully examined the content for ourselves and gained approval from the textbook adoption committee before using the text. Appropriateness for our curriculum. The text we chose was adaptable, but generally addressed the concepts and assignments taught in our Freshman English class. Ease of adaptability. Some OERs have an open license, but no apparent way to capture the content in an adaptable form. We were really not interested in writing a textbook in html! Printability. Some of our faculty expressed a strong preference for a format that would enable students to have a print book with consistent page numbers, etc. Therefore, we opted for a linear format with some hyperlinks as opposed to an interactive, nonlinear format. Accessibility - The OER should be easy to find, embed or link to in iCollege (our learning management system). While we did not make finding an OER with ADA compliance a priority, OIT made sure the final formatting was done with universal design in mind. Other OER projects also consider availability of supplementary materials such as exercises and exams and peer review of the content. Many OERs use Creative Commons Licenses to communicate just how "open" the resource is. Copyright law grants, by default, "all rights reserved" to authors (or other copyright holders) to protect their claim to a work and profits generated from it. Creative Commons is a popular way for copyright holders to modify these rights to allow others to reuse, modify, distribute, or even profit from their works without asking permission. The works are still copyrighted and must be cited when used as an information source in a research paper, but the author has opted to allow others to use the work within selected restrictions. This license specifies that you may modify, distribute, and reuse the work as long as you give attribution (credit) to the original author and you use the work non-commercially. Guidelines and examples of how to properly attribute CC works from Creative Commons Australia and the Australian Research Council Centre of Excellence for Creative Industries and Innovation. Add OERs to the library catalog and/or aggregate in LibGuides. Create content - Include links to library resources and write information literacy content for faculty-created OERs. Publish - Some libraries have OER publishing initiatives. Sponsor - Provide/administer grant funding to facilitate creation, adoption, and adaptation of OERs. Well, of course there's the rest of this guide....but also, check out the Affordable Learning Georgia website for information about OERs, grants, resources, and more.